Over the last few weeks, I’ve accumulated several new hair products. Some are brand new to market, some are tried-and-true HG products for many. 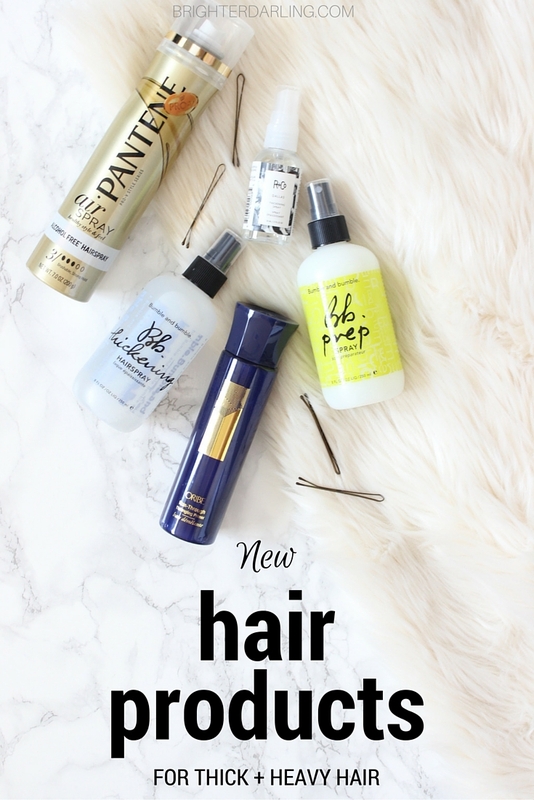 Some are total gems for me and some I’m still on the fence about; but regardless, one of these may be just what you’ve been looking for to perk up your hair game. For reference, I’m always on the lookout for products that will nourish, detangle, smooth and provide volume for my long and heavy hair. 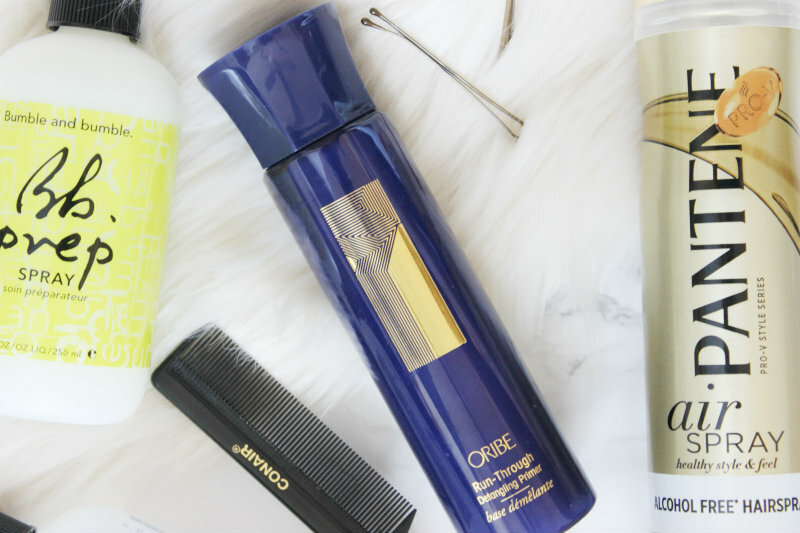 Oribe Run Through Detangling Primer, $36 // I purchased this when I finished up my last bottle of my coveted It’s a 10 Miracle Leave In Product after watching RESET, a documentary on the hair industry. The film talked about how the hair care industry has some major inflation issues, generational misalignment and salon brand loyalty. It just made me think about the brands I choose to use a little more and because of that, instead of picking up It’s a 10 (not that it’s a bad product at all), I am giving the Oribe version a chance. Oribe’s version runs about $6ish/ounce versus It’s a 10’s $4.50ish/ounce. Both smell nice (although Oribe smells a bit nicer to me), detangle my hair extremely easily (I have super knotty hair) and keep my hair super soft and smooth. Ultimately, I cannot tell one bit of a difference between these two products. If you’re looking to try something that smells a bit nicer and comes from a brand supported by many diehard high-end stylists, give it a shot by picking it up here. R + Co Dallas Thickening Spray, $12-28 // Birchbox.com has the travel-size $12 version of this product, so that’s where I picked it up after my hairdresser used it on my hair last month. I would have NEVER thought of using a thickening spray in my already-dense, thick hair. Do they make a thinning spray? BUT! This sort of product is a game changer for me. With my heavy hair, a thickening spray pumps up the volume without making it feel like I have a head full of sticky/crunchy/dry mousse. Dallas has a very strong manly scent… sort of like a cologne/aftershave, but it doesn’t last once you blow your hair out. What’s left is subtle shine and volume at the root. Use on damp hair from roots to ends and brush through before styling. 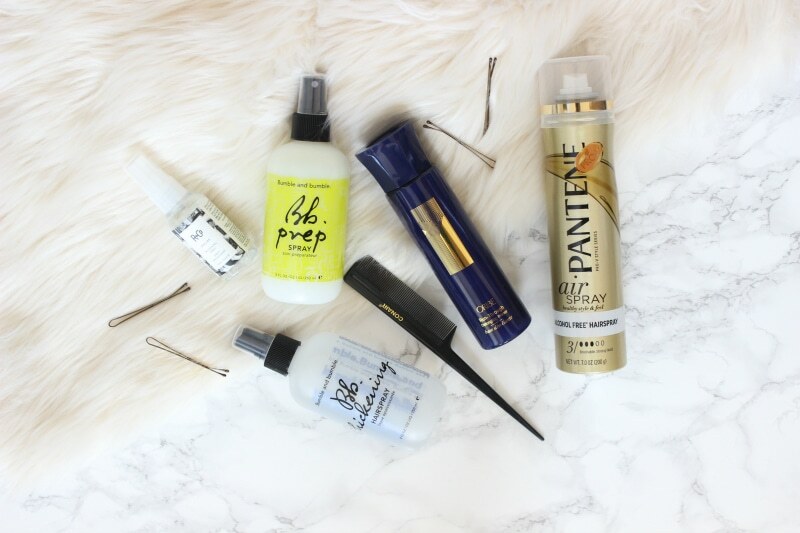 Pantene Airspray Hairspray, $5-6 // I saw this product advertised in a magazine (probably Allure) months ago and couldn’t wait to get my hands on it in place of my go-to flexible hold hairspray, Elnett. It’s the first alcohol-free aerosol hairspray, which means it won’t dry out your hair. Advertised as having flexible hold that remembers its shape, Airspray is an insanely fine mist aerosol with the typical Pantene light fresh scent. It certainly has a light, flexible hold so I use it only on days I curl my hair. The cool thing about this product is that I can layer and layer, day after day before washing and it never feels yucky. Remains soft, while subtly holding my style. I’m still on the fence if I’d repurchase instead of going back to Elnett, just because I do like the firmer hold Elnett provides, but if you are a non-hairspray-hairspray girl, you will LOVE this for the subtle hold and gentle formula. 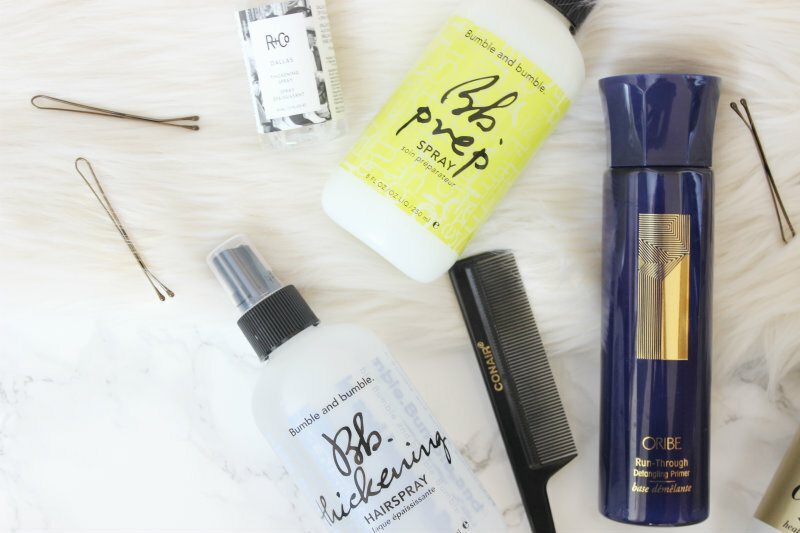 Prep, $24 // Recently, I was a hair model at a Bumble & Bumble stylist continuing education class here in Houston and got to take home a couple of Bb products. After doing a full set blow out on me (big, voluminous style), the master stylist told me I have very dense, soft, heavy hair and I may want to consider lightening up on the detangler/primer I was currently using (Oribe’s) because it may just be too heavy for me. Made sense, considering I’m always complaining about wanting more volume. So I took her recc and picked up Prep, which she used on me the day of the blow out. I’ve used Bb Tonic primer before when I was in high school and remember really liking it and Prep is very similar – just a little lighter. It helps detangle without weighing hair down and prep[ares] hair for a great blow dry. It can also be used if you want to restyle your hair after it’s been dry (think: post-gym, no time for a shampoo or post-work date night). I definitely notice my hair is a LOT fluffier when I use Prep versus Oribe. Both detangle well; Prep has a more herbal/mild scent whereas Oribe is more fragrant/musky/floral. This product may be a keeper! Thickening Hairspray, $29 // Another product picked up from my Bb hair model sess, Thickening Hairspray was used on me in the same way my normal hairdresser used R+Co’s Dallas. Semantics decoded: don’t be like me and confuse Hairspray as an actual hairspray to hold a style like you would Elnett or Pantene… this hairspray will give subtle hold, but it’s more of a hair [space] spray. After using Prep throughout my hair, she layered Thickening Hairspray overtop before blow drying and setting in big pin-curls for my voluminous blowout. Thickening provides moderate hold but major volume with or without the pin-curls. Thickening is like Dallas’s stronger, louder big sister. I find that when I use this during blow drying, my style not only holds volume, but lasts for days and looks exactly the way I expect my long hair to look: full of body and able to hold a style longer than three hours. If you have thick, dense, heavy hair like me that lacks volume and doesn’t hold a style easily, you MUST pick up this product. If you have thinner, flat hair, try Dallas first. This is my favorite of the bunch so far. I’d greatly appreciate your support in using any of my affiliate links throughout this post. I would not utilize affiliate links if I did not support the brand/product wholeheartedly. Read my full disclaimer here. Demi Lovato Chops Off Her Long Hair – See Her Transformation! "Holy Grail Beauty Products | [products I repeatedly repurchase]"